Produced by Lady Strong’s Bonfire. Performers: Tessa Bide, Liz Hart, Tomasin Cuthbert. Opened at The Wardrobe Theatre, Bristol. May 2016. Our Bed knows us best of all. It is holder of our dreams, comforter of our tears. It soaks up our blood, our sweat, and caresses us in the heat of our passions. It confines us. Heals us. Welcomes us when we arrive, and is the last to say goodbye to us when we leave. Here we are all naked. The Bed sees through all our disguises. The Bed is the journey of a woman and is a celebration of some of the most potent times in her life. The times of changeover. Her gateway times from One to Other. Using mask, puppetry, clown, visceral physical performance and a hypnotic original sound-score, we delve into the dream world, the physical world and everything in between. 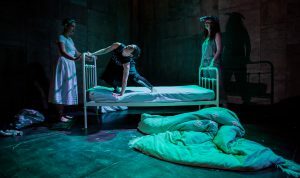 The Bed is the first theatrical endeavour from Lady Strong’s Bonfire. Combining the talents of Tomasin Cuthbert (Soap Soup Theatre), Tessa Bide (Tessa Bide Productions) and Liz Hart (Bric a Brac Productions), with immersive sound and music by Chris Menes.